In 1968 Chögyam Trungpa did a retreat where he discovered The Sadhana of Mahamudra, a terma text, or treasure teaching, that illuminated the problems of spiritual corruption and materialism. From that time on, his teaching was dedicated to providing his students with the wisdom and skill to overcome these problems in themselves and in the world. 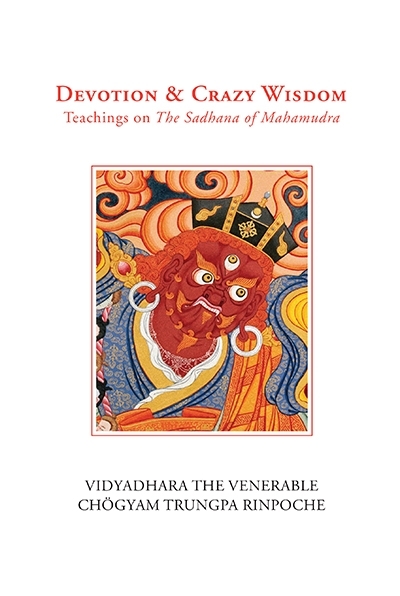 In 1975, Rinpoche presented two seminars* to unpack the meaning of the sadhana. In these ten talks, he lays the groundwork we need to gain a deeper appreciation of this profound text and how it applies to our own life and practice. As he himself states in the book, "The sadhana is a prototype of how emotion and wisdom can work together." Previously published as a lightly edited sourcebook, Devotion and Crazy Wisdom has many new features. The original editing of the talks has been reviewed and corrected, with headings added to facilitate study. New material includes a foreward by Lady Diana Mukpo, an introduction by Barry Boyce, an article by Chögyam Trungpa on the seed syllable HUM, and an article based on these talks, previously published in the Shambhala Sun magazine. Also included are an in-depth glossary and illustrations of figures in the sadhana, as well as several photographs of Chögyam Trungpa's own journey to Taktsang.